Siemens / 07.05.2015: ENON GmbH has placed an order with Siemens for a Vectron type locomotive for its railfreight subsidiary EGP (Eisenbahngesellschaft Potsdam). It is intended for cross-border traffic in Austria and Germany. Delivery is scheduled to take place in August 2015. The locomotive is equipped with a shunting module for shunting or railway siding trips. Railcolor: It is the first Vectron AC locomotive with shunting module (a 180 kW diesel engine for short distances) that has been ordered. Siemens currently has 193 930, with this module, in Cerhenice (CZ) for testing purposes. Previously, Italian freight operator CFI ordered Vectron DC machines that will get shunting modules too. However, one question remains, does it already have the shunting diesel module or not? [update] The diesel shunting module, ordered for this locomotive, is most likely not there yet. It will be installed somewhere in the next months. So at this moment, 193 848 is a normal AC electric locomotive. Today, the brand new Siemens 21970 - 193 848 completed its maiden run to Donauwörth. The machine is still white, so its future owner (Enon) has not decided yet what livery it wants to apply on the machine. According to the official information, this locomotive will be used by Eisenbahngesellschaft Potsdam (EGP), starting in August. The locomotive should be the first Vectron AC locomotive in service with diesel shunting module. Its REV? 03.07.2015. In August 2015, EGP from Potsdam, a freight operator in Germany, will get a new Vectron AC locomotive with shunting diesel. Of course we made a design impression. Siemens: ENON GmbH has placed an order with Siemens for a Vectron type locomotive for its railfreight subsidiary EGP (Eisenbahngesellschaft Potsdam). It is intended for cross-border traffic in Austria and Germany. Delivery is scheduled to take place in August 2015. The locomotive is equipped with a shunting module for shunting or railway siding trips. Railcolor: It is the first Vectron AC locomotive with shunting module (a 180 kW diesel engine for short distances) that has been ordered. Siemens currently has 193 930, with this module, in Cerhenice (CZ) for testing purposes. 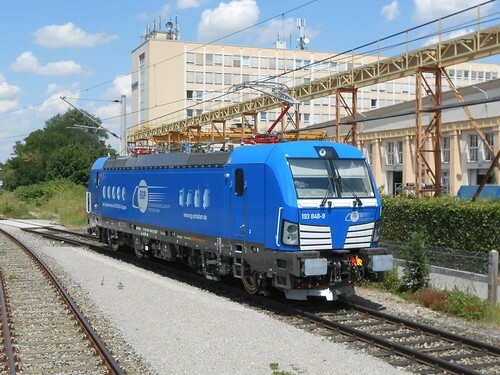 Previously, Italian freight operator CFI ordered Vectron DC machines that will get shunting modules too. The time path for this order is currently unclear, as the homologation process for Italy is still not completed.